Last night a story broke — just as I was about to head to bed, mind you — suggesting that Apple is going to launch a brand new iPhone sometime around the second quarter of this year and with a bigger 4.6-inch Retina Display. That's more than an inch larger than the current screen on the iPhone 4S, which seems a bit drastic for Apple. As a current Galaxy Note user, though, it got me excited about possibly switching back to iOS. I'm one of those "weirdos" that loves the bigger displays on smartphones — they're great for reading comics, watching videos and browsing through photos. Then this morning more news broke that pretty much confirms Apple is going to include 4G LTE support in its next iPhone. I'm 99.999% sure that it will – there's no way Apple is going to release a 3G device. In any case, all of this got me thinking, what do I want in my next iPhone? What kind of features are going to bring me back to iOS? I love the platform — don't get me wrong — I just love the screen sizes on Android devices right now. 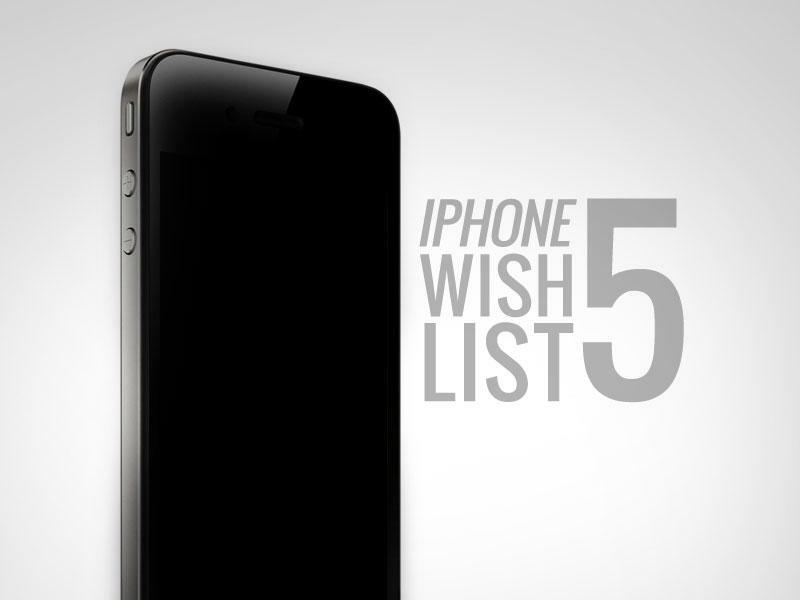 So here goes nothing — here's my iPhone 5 wish list. The whole reason I'm writing this article is because the idea of a bigger screen on an iPhone had me salivating. I just can't get on board with the 3.5-inch screen on the current model. I used to love it: it was perfect for gaming, it's insanely pocketable and the Retina Display is super crisp. I've just grown tired of the screen in comparison to Samsung's Super AMOLED HD displays and other screens found on high-end smartphones from HTC and LG. A 4.6-inch Retina Display will definitely grab my attention all over again. iOS is unique in that it's stupidly simple to use, which is why it's so popular as a mass market device. You don't have to think about anything — all of your apps are in one place on the home screen and, if you so choose, you can organize them with folders. But I want to see my wallpaper and I want to see homescreen widgets for at-a-glance weather and other data. It doesn't have to actually exist on the homescreen, however, and I don't think Apple will ever actually take that approach. I love Apple's current drop-down menu for viewing stocks and weather, but I want more. I want to be able to see a ticker of news feeds, a ticker of Twitter mentions and much more. It'll come, I have no doubt, I just hope it's ready for the iPhone 5. The iPod touch is probably one of the sexiest electronics on the market today and it's largely due to its super thin form factor. I'd love to see Apple try to squeeze 4G LTE, a quad-core graphics processor and much more into a device that's just as thin. I'm not sure it's going to be possible, however. That's a lot of power in such a cramped place, which means heat dissipation could be an issue, but we'll see. Who am I to complain about bulk? I carry a Galaxy Note. I absolutely love the iPhone 4/4S industrial design and that it's made out of glass and aluminum. It's a stunningly beautiful device and perhaps one of the most attractive on the market. But it's a shame that users have to cover up all of that beauty with a bulky cases. What's the point? It's like buying a Picasso and then throwing a sheet over it. Or buying a new couch and putting plastic covers on it so that nobody wants to sit on it. I hope Apple goes back to its original iPhone or iPhone 3G/3GS roots and creates a device that doesn't need to be hidden in order to be protected. This one's a given, but it has to be on my list. I hope, and truly believe, that Apple will introduce 4G LTE connectivity in the next generation iPhone. The latest rumors suggest that it won't support voice-over-LTE (VoLTE), but at least it appears that FaceTime over 4G will be supported. We'll have to wait and see, but AT&T and Verizon are currently offering insanely fast 4G LTE speeds here in New York City — faster than my home internet connection, even. I'm not too worried about a quad-core CPU, the iPhone 4S seems to handle iOS without a hitch as it is. But I would like to see Apple include quad-core graphics in the new iPhone just as it did in the new iPads. There's no doubt it will, either, since developers are already on board creating new games capable of taking advantage of the added power in the new iPad. I'm a huge Dungeon Hunter fan, so I can't wait to see what kinds of other dungeon-crawler games, like Infinity Blade: Dungeons, developers think up. I've said it before and I'll say it again: I'm awkwardly obsessed with the idea of using my phone for mobile payments. I've tried using Google Wallet on the Galaxy S 4G and I wasn't entirely blown away. There just aren't enough retailers offering support yet and security has already been an issue. I think Apple's popularity and influence could help it become the catalyst through which NFC and mobile payments take off in the United States. I want to use my iPhone 5 to tap-and-go for entrance to the subway, to buy meals, to pay for taxis and much more. It's possible, and I hope it happens soon. Those are just a few of my wishes for the iPhone 5. What are yours? If Apple's next generation device doesn't suit your fancy, head on over to my recent roundup of Samsung Galaxy S III rumors. There's no doubt these two phones will be going head-to-head.